With an outlook to reduce our footprint and energy consumption, cycling has become a popular past time, a fun sport and a mode of commuting to work. Many of us might know someone who cycles to work every day as part of their lifestyle if we don’t do it ourselves. Drivers are often navigating bicycle lanes daily throughout the centre of town and along well travelled routes. Or, we have kids who just crazy about cycling either for play or for sport. In fact, cycling has branched out to accommodate a wide range of terrain and purposes than ever before. 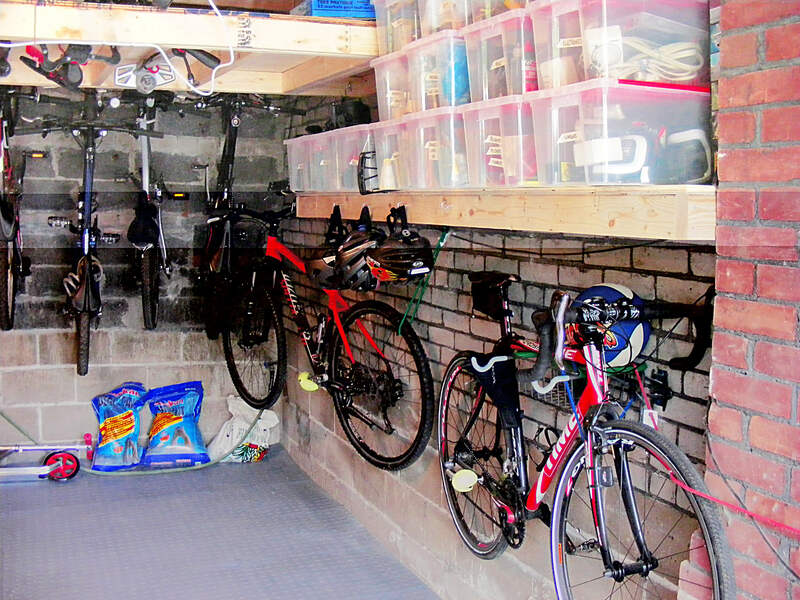 During the typical garage renovation, homeowners often encounter the challenge of bike storage and how to accommodate an entire family of cycling requirements through the summer and during the winter or off-season for most cyclists. These days there a wide variety of bikes to fit the different type of cycling that people do. Let’s review some of the more popular bicycle types and a variety of bicycle storage solutions to fit the entire family. Mountain bikes were designed for off-road terrain and trails. They have a low gear range to ride up steep trails and some have shock absorbers or suspensions for the front and / or rear to handle a much rougher terrain. A lot of younger riders enjoy the mountain bike style for riding around the neighbourhood, school or community centre. Road bikes were designed to be ridden on smooth paved surfaces. They have skinny tires for speed and drop down handle bars for the rider’s comfort. The frame is typically lighter than many of the other types of bikes. The skinny tires allows for great speeds in long distances of flat paved road. The bike was not designed for a lot of stop and go traffic, sandy or gravelly surfaces such as roads under construction or pot holes when roads have not yet been repaired. Since the introduction of spin classes, a lot of people who would cycle for fitness indoors started to take the sport outdoors during the warm weather. 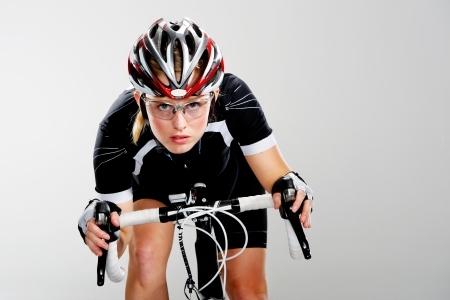 These days, people who get into cycling for fitness or sport often tend to invest in a road bike, join cycling clubs and consider charity bike rides to set fitness goals for themselves. These bikes were designed to leverage the advantages of a road bike with the advantages of mountain bikes. They have larger padded seats and upright handlebars for a more comfortable riding position. They have medium width tires with a semi-smooth tread for a smooth ride on pavement but an ability to ride on unpaved surfaces as well. They are heavier than road bikes but not quite as heavy as the mountain bike. It makes the bike ideal for riding around the neighbourhood or commuting to work or school with the smooth ride of a road bike and the confidence of stability that we might expect from a mountain bike. The city bike was designed with the most upright sitting position of all these bike styles. The city bike was designed to ride in regular clothes such as a typical work outfit. 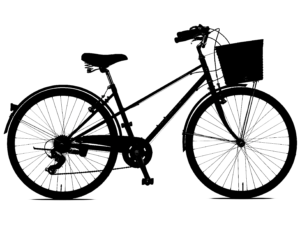 The typical city bike will include fenders, a chain guard and a skirt guard around the rear wheel to protect the rider’s clothing from water, dirt or mud encountered along the path during a commute. The additional accessories add weight to the bike making it a heavier bike than the hybrid bike. To make the bike easier to use, a city bike may have an internally-geared rear hub which has been used more throughout Europe where bikes are used more often for commuting than sport or leisure. This gear hub is easier to use and practically maintenance free and much more durable than the typical derailleurs which has been the typical gears of a North American bike. In addition, some city bikes come with a built-in generator to power lights for riding after dark. For the rider looking for comfort, this is the bike! Regardless of the type of bikes we might each choose to ride, we need to store them. So, there are many options for bike storage. With busy on the go kids playing all throughout the summer, they need an easy way to get into the house and then back out riding again. The “on the floor” bike rack makes it easy and more likely that kids will get into the habit of putting their bikes away in a safe spot within the garage. 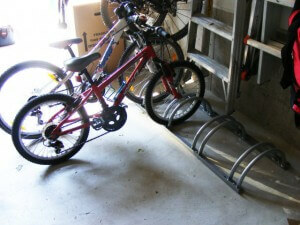 While building good habits, it also keeps their bicycles off the driveway where bikes often damage the family vehicles. 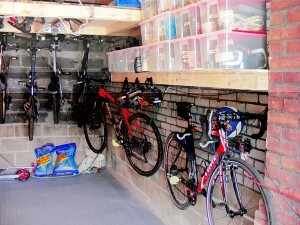 When it comes to wall mount bike storage, there are a couple of ways to use wall mount racks. Most often, we’ll mount bicycles along the wall to maximize the space available for the vehicles to park inside the garage. When someone has many bikes and wall space is at a premium, we can mount bicycles perpendicular to the wall to maximize the number of bikes we can fit onto the wall. For younger family members, the key is to assure that the wall mounts are low enough that young people can lift their bike onto the mounting hooks all on their own. 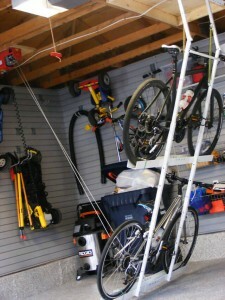 The hydraulic overhead bike lift is an effective storage option for both summer and winter bicycle storage. Family members of all heights and strength can use this type of bike storage quite easily with a flip of a switch to lift the bicycles away. Often, if there are not enough bikes to fill the entire rack, people use it to store other sports equipment such as a bag full of golf clubs. Every year, creative new ways to store bikes keep appearing in the marketplace. 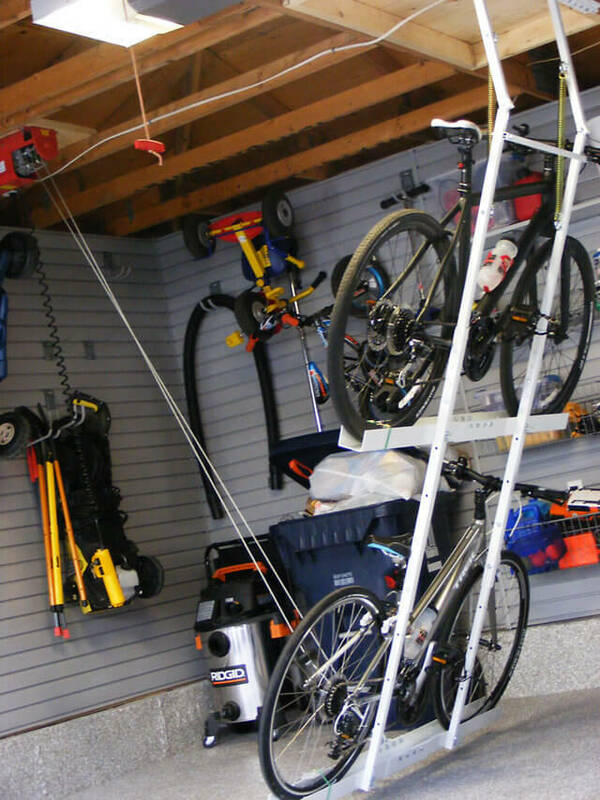 Based on the number of bikes you need to store and your family’s overall garage storage requirements, a little planning will make your bicycle rack storage options become apparent. When reviewing your next garage renovation, consider the amount of space you have available and how you might need to use it for storage. If you’re looking for professional help, book our complimentary in-home consultation to give yourself adequate lead time on professional services .